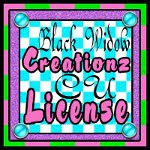 I am using my own kit called Wild Rider, you can find this at stores I sell at, just check the left column of my blog for the links to where I sell my kits. HERE is the blog post about the kit. This tutorial is for Gimp 2.8 but any version will work, you can easily convert to your program of choice as well. Element 14- scale to 319 x 39, duplicate and place copy on top of other, duplicate, LAYER>TRANSFORM>ROTATE 90 clockwise. Duplicate, flip and place on other side. Duplicate bottom and LAYER>TRANSFORM>180. Merge the four together to make a frame. 3. For paper 2, you will need to drag and drop DBV Mask 110 into canvas. Then scale it to 700 x 700. Go up to COLORS>INVERT and LAYER>TRANSPARENCY>COLOR TO ALPHA to make it transparent. Next R click on it in layers box and choose ALPHA TO SELECTION, L click once on paper 2 layer to activate the layer within the layers box. Go up to SELECT>INVERT and EDIT>CLEAR. The paper is now the mask, so you can delete the original mask layer Repeat the same steps with WSL_Mask48 (first scale to 936 x 936) and paper 5. 4. Add the tube of choice to your tag, including current/correct copyrights. Copyright symbol, artist's name, website and license number, if applicable, should all be clearly visible on the tag. For the background effect, place tubes accordingly then go to the MODE box at the top right corner of layers box and choose OVERLAY. Add a drop shadow to the tube by going to FILTERS>LIGHT AND SHADOW>DROP SHADOW with settings at 8/8/15. Add drop shadow to all other elements with settings at 2/2/8. 5. For the text I used a font called FREEDOM in black. Right click, ALPHA TO SELECTION, GROW by 2, add new layer, fill with white. Go up to FILTERS>NOISE>RGB NOISE, with correlated checked only and settings at 20/20/20/0. Add drop shadow with same settings as used before.